The studio is available for multi-purpose use when classes are not in session. Aerobics, yoga, and dance classes are held weekly. We also have dumbbells, stability balls, kickboxing gear, medicine balls, and yoga mats available for use. On the North end of the running track overlooking the gym, we have a full assortment of treadmills, stair climbers, upright and recumbent bicycles, elliptical machines, adaptive motion trainer (AMT), indoor rowers, SkiErg and a heavy and speed bag. All equipment is on a first come, first serve basis. Please limit your time in the evenings when use is in demand. 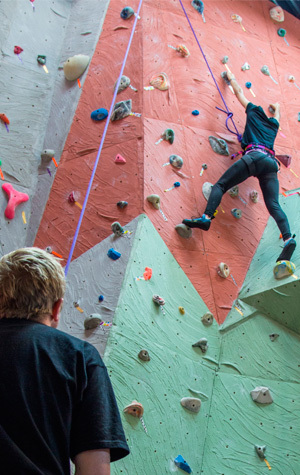 The UAS Climbing wall offers both bouldering and climbing on belay over textured panels. The ceiling height is approx.. 30' at its peak and offers challenging routes for any skill level. All necessary climbing equipment to include shoes, harness/belay, and chalk are provided. All climbers are required to take a climbing orientation before using the gym. Scheduled sessions during the Fall and Spring semesters are posted on the climbing board outside the door to the climbing wall and on our event calendar. Once approved by the climbing coordinator, you must leave your UAS ID at the help desk before entering the climbing gym. Certification is good for 1 year, requiring re-certificaion when expired. For gym rules please visit our facility policies page. 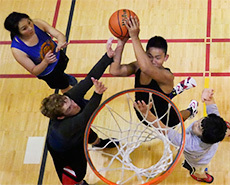 There is a multi-purpose basketball, volleyball, and badminton court in the main gym. This area is used by both intramural sports, P.E. classes and open gym for pick-up games. Open gym hours will be posted each semester at the REC as well as on our events calendar. The SAC multi-use facility is a great venue to host dances, films, musicians, televised big screen events, billiards & ping pong competitions, as wells as a place for REC Center members to hang out, socialize, and relax. Not much time between classes or want to work out before work? Lockers can be rented as a semester, school year, or annual rate. We have half lockers and cubicles. Please view the rental agreement for details. Showers are available for members in both the men's and women's locker rooms. There is a disabled patron’s restroom/shower area at the opposite end of the main hallway. The ORC is a great resource to the UAS community for outdoor gear needs. Rental equipment includes aquatic, camping, snow, safety, and accessory gear. Suspended above the court/gym space is a textured and sloped running track. 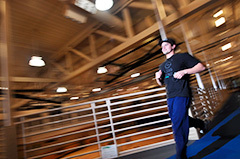 The track offers indoor running/jogging for those occasional rainy days. Along the running track is an assortment of cardiovascular equipment, punching/speed bags, and stretching mats. 14 laps on the track is 1 mile on the outside lane. The weight room consists of free weights/benches, Nautilus machines, and Paramount stations. A wide variety of healthy beverages and snacks are available for purchase at the REC Center service desk. Please keep all food and drinks in designated areas. The REC Center has two classrooms that are for member use when not reserved for classes or rental. These rooms remain locked but can be opened and used by UAS clubs or members upon request. These rooms include 115 and 116. Both rooms are large in size and can accommodate larger class/lecture sizes.